The Kuala Lumpur Deer Park is a beautiful spot where the landscaping has been well thought out and lush trees and shrubs planted to ensure that the habitat is cooling and peaceful. There are also ponds around the park. A well-chosen peaceful area that is more than 2ha in size has been turned into a suitable habitat for the deer. It is interesting to see hinds, does and fawns, representing some of the smaller species, roaming freely in the sprawling valley. 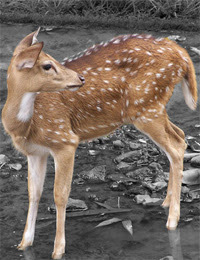 Perhaps Malaysia most famous deer, the rainforest mousedeer or kancil, can be seen here. The mousedeer is the world’s smallest hoofed animal and a popular figure in local folklore due to its legendary wit. Visitors are allowed to mingle with these friendly and adorable deers. Much to visitor’s delight, these friendly deer will usually come close to be fed as you watch them. My girlfriend and i visited the Deer Park this saturday. I arrived early at bout 8.45a.m but to my disappointment, the information given on this website is wrong. We was chased out by the caretaker as the park only opens at 10a.m and not 9a.m. Still being excited to visit the park, we waited until 10a.m. To my disappointment again, the park is not maintained at all. The surroundings are very dirty. There is a man made fish pond which has an uneasy smell. There is such small space for the fishes and the pond is congested. Further, we could not even touch the deers what more to feed. There is also a board saying visitors not allowed to feed deers with outside food. But i could not see anywhere where we could the food for the deers from inside the park. Being a Malaysian who has the interests to visit this kind of place, it is very disaapointing with this kind of turn-out. I really hope the relevant authorities will do something to improve the condition of the park. Maybe can start by editing the website and stated out the correct visiting hours. Yes, you can feed the deers, but there will be a lady inside selling the bread for the deers, quite expensive as 3 pieces of bread for RM1. However, i agree with the maintenance part, but,… recently, i believe the place has been improved although the pond still remains dirty. I was very disappointed with the Deer Park. My son turned one yesterday and we thought that a trip to the Deer Park will be very enjoyable for him. We planned for this weeks in advance just to make sure that the trip was pleasant. BUT —- it ended being just a waste of time and effort! 2) We waited outside for 1/2 hour with a baby assuming that it will open at 10.00am as stated. BUT at 10.20am it was still closed!!! We left after that and have vowed never to make another trip there again. We will also spread this information to all we know.